Feldenkrais and Sounder Sleep workshop. With Steve Cheslett-Davey ; Feldenkrais Method and Sounder Sleep teacher. The Sounder Sleep System is a development and application of the Feldenkrais Method and is holistic, non-pharmaceutical approach to learning how to improve your sleep. It draws its practices from the Feldenkrais Method, various mindfulness modalities and recent neuroscience. 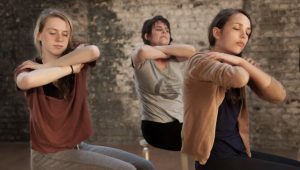 The workshop will start with an experiential introduction to the Feldenkrais Method of mindful movement and will then move on to the practice of Sounder Sleep techniques. The Sounder Sleep system comprises gentle breathing and micro-movement techniques called Day-Tamers and Night-Tamers. You practice Day-Tamers during the day to reduce the effects of stress so that your night-time sleep is more settled and pleasurable. If you wake during the night the Night-Tamers can get you back to sleep almost instantly. This day long immersive workshop is ideal for anyone new to the Sounder Sleep System as-well as being a great refresher /review for more experienced students. Please bring along a pillow/comfortable mat/duvet and lunch . Tea and coffee and snacks will be provided.